Equipo Nizkor - CRS R44337 - American Agriculture and the Trans-Pacific Partnership (TPP) Agreement. The Trans-Pacific Partnership (TPP) is a regional free trade agreement (FTA), which the United States concluded with 11 other Pacific-facing nations in October 2015: Australia, Brunei, Canada, Chile, Japan, Malaysia, Mexico, New Zealand, Peru, Singapore, and Vietnam. Approval by Congress (through implementing legislation) is required before TPP can enter into force. If the United States and the other 11 governments ratify the deal, TPP would materially increase the overseas markets to which U.S. agricultural products would have preferential access. Exports account for around one-fifth of U.S. farm production, so foreign sales provide material support to commodity prices and farm income. For U.S. agriculture and food industry interests, much of the potential benefit from TPP lies in improving access to TPP markets by eliminating or lowering tariffs, and also increasing the quantity of products that may be imported on preferential terms under tariff rate quotas (TRQs). TRQs allow imports of a given product to enter duty-free, or at a reduced rate, within the quota amount. Quantities in excess of the quota are subject to higher duties that can be prohibitive. The opportunity to increase sales of farm and food products is expected to be greatest in the five TPP countries with which the United States has not concluded FTAs, particularly Japan and Vietnam. For example, the TPP agreement would substantially lower the tariff that Japan applies to U.S. fresh, chilled and frozen beef cuts—from 38.5% currently to 27.5%—when the agreement enters into force, with further reductions down to 9% over 15 years. Significantly, this would place U.S. beef on par with the tariff treatment for Australian beef, which is the major competitor of U.S. beef in Japan and which currently enjoys a tariff preference under an FTA with Japan. Japan also would create new TRQs specific to U.S. wheat and rice, among other agricultural products, thereby expanding U.S. export opportunities across a number of product categories. The corollary to the potential for greater export opportunities for U.S. farm products under TPP is that the United States would lower and eliminate tariffs on many agricultural product imports— such as tree nuts, peanuts, cotton, various fruits, tobacco, and wine, among others. The United States also would provide limited additional duty-free access to farm imports via new TRQs for dairy products and for sugar and sugar-containing products. U.S. farm products, such as beef, that enjoy preferential access to Canada and Mexico under the North American Free Trade Agreement (NAFTA) would relinquish that advantage as tariffs are lowered over time for TPP partners. While tariff rate reductions and TRQs have long been a staple of trade liberalization efforts, TPP also seeks to address several non-tariff measures that can impede trade in food and agricultural products. Among these are sanitary and phytosanitary measures (SPS), which concern actions by governments to assure food safety and guard against plant pests and animal diseases. TPP seeks to curb the use of SPS measures as impediments to trade and provides procedures for resolving disputes that arise, including recourse to dispute settlement. TPP also aims to minimize disruptions to trade in products of agricultural biotechnology and to bring greater coordination to the use of geographic indications, which involve exclusive naming rights for distinctive products from specific geographic locations. TPP commits countries to eliminate the use of export subsidies for agricultural products, which the United States does not employ, and seeks to reduce technical barriers to trade in wine and spirits by creating common definitions of these products and by establishing parameters for labeling and certification. As of late-December 2015, numerous major farm and food trade organizations had endorsed the TPP agreement, but support within the farm and food sector has not been universal. The National Farmers Union, the United Food and Commercial Workers Union, and organizations representing tobacco leaf growers have all expressed opposition to the agreement. Exports make a vital contribution to U.S. agriculture, absorbing about 20% of total agricultural production, while representing a far larger share of the production of certain commodities, including wheat, rice, soybeans, cotton, almonds, pecans, pistachios, and walnuts, to name a few. As such, foreign demand for U.S. food and fiber contributes materially to higher commodity prices and farm income. The positive ripple effects from farm trade extend beyond farmers and ranchers to rural communities; farm input industries that provide seed, fertilizer, and machinery; and commodity processors and food manufacturers with a stake in foreign markets. Exports also can contribute to higher input prices for food to the extent that additional foreign demand is not met by an increase in domestic supplies, although commodity costs amount to a fraction of overall retail food prices. Rising farm productivity, market-oriented U.S. farm policies, and the prospect of competing on more favorable terms for a larger share of the faster-growing food markets in many developing countries are among the reasons that negotiations aimed at liberalizing agricultural trade among TPP countries have elicited a high level of interest and broad-based engagement from U.S. agriculture and food industry interests. TPP countries already loom large in U.S. farm and food trade: in 2014, U.S. agricultural exports to these countries totaled $63 billion, or 42% of total exports, while TPP countries were the source for $57 billion in U.S. agricultural imports, amounting to about one-half of the U.S. total. Even so, it appears the TPP agreement reached in October 2015 would significantly improve market access for many U.S. food and agricultural products, potentially enhancing U.S. competitiveness in a number of TPP markets. At the same time, the trade deal also would provide TPP partners with greater access to U.S. product markets, potentially raising the level of competition among some U.S. products. The U.S. International Trade Commission (USITC) is to issue a report on the projected economic impact of the agreement on the U.S. economy as a whole as well as on specific industry sectors and on consumers as mandated by P.L. 114-26, the law that provides the President with trade promotion authority. |3| P.L. 114-26 directs USITC to submit its report as soon as practicable, but no later than June 1, 2018. To this end, the agency plans to hold a public hearing to gather information for the report on January 13, 2016, and will accept written input up to February 15, 2016. |4| USITC has stated it anticipates the report will be transmitted to Congress and to the President by May 18, 2016. The text below identifies four considerations about the TPP agreement that are particularly relevant for U.S. food and agriculture. This is followed by a partial snapshot of some of the higher-profile improvements in market access for agricultural products in the agreement, a summary of selected provisions beyond market access that are of interest to food and agriculture, a brief overview of industry reactions to the agreement, and a review of what would need to occur for the agreement to enter into force for the United States. 1. An overarching consideration is that among significant TPP markets, the United States lacks free trade agreements (FTAs) with five TPP countries: Brunei, Japan, Malaysia, New Zealand, and Vietnam. Among these five, the most significant for U.S. agricultural exports are Japan, Vietnam, and Malaysia. With a combined population of roughly 250 million, these three countries likely offer the greatest potential for boosting U.S. farm and food exports via lower tariffs, or expanded tariff rate quotas (TRQs). |5| Significantly, all three countries impose much higher average applied most-favored-nation (MFN) |6| agricultural tariffs than the United States, which could work to the advantage of U.S. farm and food exports versus domestic suppliers and non-TPP export competitors as tariffs decline under the agreement. In 2014, applied MFN tariffs on agricultural products averaged 5.1% in the United States, 9.3% in Malaysia, 14.3% in Japan, and 16.3% in Vietnam. |7| Moreover, as illustrated in Figure 1, existing tariff peaks are far higher for a number of product categories. Examples include dairy and poultry imports into Canada; bovine meat, rice, and dairy products into Japan; and Vietnamese tariffs across a number of food categories. Japan is likely the leading agricultural market opportunity in the TPP due to its highly protected farm and food markets, large population, and high per capita gross domestic product. Vietnam, with the fourth largest population in the TPP and a fast-growing economy, is viewed as a market that could hold significant future growth potential for U.S. farm and food products. At the same time, preferential access that U.S. food and agricultural interests have to markets in Canada and Mexico under the North American Free Trade Agreement (NAFTA) would become available to a wider group of potential competitors over time as tariffs are lowered within the TPP zone. Notes: Most-favored-nation (MFN) tariffs are normal non-discriminatory tariffs, excluding preferential tariffs under free-trade agreements or tariffs charged inside quotas. 2. 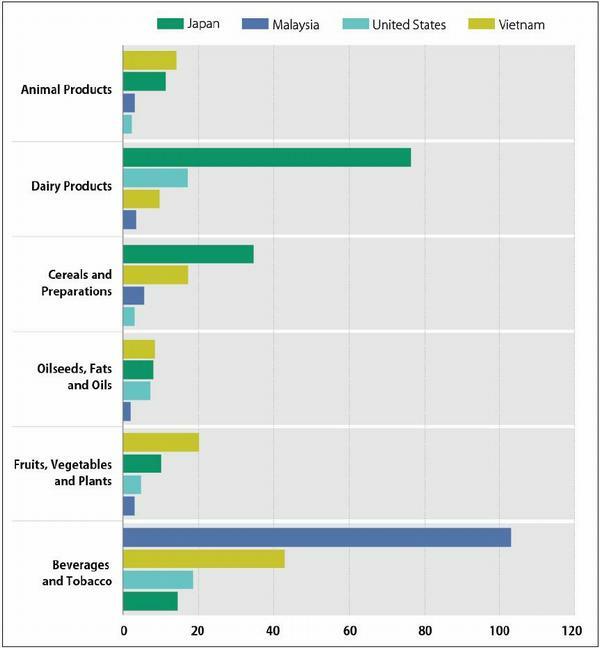 Also significant is that potential key export expansion opportunities for U.S. food and agricultural interests, such as beef and pork to Japan and dairy products to Japan, Canada, and Vietnam, generally are to be phased in over a period of years, if not decades. For certain products in certain countries, including Japan for beef, pork, and whey powder, and the United States for some dairy products, safeguard measures allow for additional tariffs to be imposed for a period of time if imports should exceed specified thresholds. |8| Generally, the quantitative trigger level for invoking safeguard measures would increase over time even as duties imposed under the safeguard are scheduled to be reduced or eliminated. 3. If the United States chooses not to implement the TPP agreement, U.S. agricultural export competitors would have an opportunity to gain a competitive edge over U.S. exports of certain products to Japan and elsewhere. This could occur as a result of existing preferential tariff arrangements—such as Australia's FTA with Japan—or by ratifying an agreement similar to TPP without U.S. participation. Also, while the European Union is not party to the TPP, it is negotiating FTAs with Japan, Malaysia, and Vietnam that could enhance its competitive position in those markets. 4. Finally, it is worth recognizing at the outset what the TPP agreement is not designed to accomplish. Similar to other FTAs, the TPP generally would not address domestic subsidy regimes that may tend to distort trade. Attempting to impose disciplines around domestic subsidies schemes has generally been the province of multilateral trade negotiations under the auspices of the World Trade Organization (WTO) and its predecessor, the General Agreement on Tariffs and Trade (GATT). The TPP agreement would affect market access for a broad range of agricultural commodities and food products. What follows is a non-comprehensive selection of some of the notable changes by commodity that are included in the agreement. Beef: Japan ranks as the largest U.S. export market for beef and beef products, according to the U.S. Department of Agriculture (USDA). Under the TPP agreement, Japan would drop its current tariff on fresh, chilled, and frozen beef from 38.5% to 27.5% in year one, with subsequent annual reductions to 9% by year 16. Japan would lower tariffs on other beef products as well, while Vietnam would eliminate such tariffs over three to eight years. The United States, for its part, would eliminate tariffs on beef and beef products that range as high as 26.4% in no more than 15 years and in fewer than 10 years in most instances. Pork: Japan, which also ranks as the leading market in the world for U.S. pork and pork product exports, would immediately cut its tariff of 4.3% on fresh, chilled, and frozen pork cuts to 2.2%, phasing out the residual over nine years. A separate duty on pork cuts under Japan's "gate price system," which acts as a minimum import price, would be lowered immediately to 125 yen per kilogram, from 482 yen now. This duty would then be cut to 70 yen in year five and subsequently lowered each year thereafter to reach 50 yen in year 10. A special U.S.-specific safeguard would allow Japan to temporarily increase the duty during this transition period if imports were to exceed a trigger level. Vietnam would eliminate tariffs that are as high as 34% on pork and pork products within 10 years, while the United States would immediately eliminate most such tariffs. Poultry: Canada would allow incremental increases in access to its highly protected poultry and egg markets over five years via new duty-free, TPP-wide TRQs amounting to 2.3% of domestic production for eggs, 2.1% for chicken, 2% for turkey, and 1.5% for broiler hatching eggs. Thereafter, the quotas would be raised moderately each year, plateauing in year 19. Vietnamese tariffs on poultry of up to 40% would be eliminated within 13 years. U.S. tariffs of up to 18.6% ad valorem equivalent would be eliminated within 10 years. Corn and Corn Products: Japan would create a new country-specific quota (CSQ) for U.S. corn and potato starch of 2,500 tons that would increase to 3,200 tons in six years, and would expand a TPP-wide TRQ for starches. Vietnam would eliminate tariffs as high as 30% within four to seven years and a tariff of 5% on feed corn in five years. Malaysia would immediately eliminate tariffs of up to 8%. U.S. tariffs as high as 3.4% would be eliminated within 10 years. Soybeans and Soybean Products: Japan would immediately eliminate a 4.2% tariff on soybean meal and, within six years, would eliminate a tariff of up to 13.2 yen/kg on soybean oil. Vietnam's tariff of 5% would be eliminated immediately, while tariffs on soybean products would be eliminated within 11 years. Malaysia would immediately eliminate tariffs of up to 10%. U.S. tariffs on soybean products of up to 19.1% would be eliminated within 10 years. Wheat and Wheat Products: Japan, the largest importer of U.S. wheat, limits its wheat imports through an existing TRQ, which accounts for 90% of its imports. A government-imposed markup on in-quota wheat to domestic buyers of 17 Japanese yen per kilogram would be lowered over nine years to between 8.5 and 9.4 yen, depending on the wheat variety imported. Japan also would establish a new duty-free, country-specific quota (CSQ) exclusively for U.S. wheat of 114,000 metric tons (equal to about 0.5% of U.S. wheat exports in the 2014/2015 marketing year), which would be increased to 150,000 tons in seven years and which also would be subject to the same progressively lower markup price. Japan also would provide new CSQs for U.S. processed wheat products, such as mixes, doughs, and cake mix. The initial CSQ for these products of 10,500 tons would be increased to 12,000 tons over six years, as well as new TPP-wide TRQs for wheat products and wheat-based food preparations. Vietnam would eliminate tariffs of up to 31% within four years, while Malaysian tariffs as high as 7% would be eliminated immediately. U.S. tariffs that are as high as 6.8% would be eliminated within 10 years. Barley and Barley Products: Japan would establish a new TPP-wide TRQ for barley of25,000 metric tons that expand to 65,000 tons over nine years along with a progressive reduction in the maximum markup it imposes on quantities under this TRQ from 7.6 yen to 4.4 yen over nine years. Moreover, Japan would eliminate its tariff on feed barley of 39 yen per kilogram. It also would create new duty-free CSQs for imports of U.S. unroasted and roasted malt. The CSQ for unroasted malt would begin at 20,000 metric tons and increase to 32,000 tons over six years, while that of roasted malt would increase over 11 years from 700 tons to 1,050 tons. U.S. tariffs would be eliminated once the agreement enters into force. Rice: Japan, the second-largest overseas market for U.S. rice, would establish a new duty-free quota for U.S. rice of 50,000 tons initially, rising to 70,000 tons in year 13, but still well below the 165,000 tons the U.S. rice industry had sought. Japan also would allow a broader range of domestic entities to participate in tenders on this additional quota, as well as on 60,000 tons of rice under an existing quota. But Japanese officials indicate that the "minimum markup" Japan imposes on rice imports—equivalent to a 15-20% duty according to USA Rice— would continue to be applied to all imports. U.S. tariffs on rice products of up to 11.2% would be eliminated within 15 years. Cotton: All of Vietnam's tariffs on cotton, which range up to 10%, would be eliminated in four years or fewer. In 2014, nearly all of Vietnam's imports of U.S. cotton, amounting to nearly $400 million, consisted of cotton that was not carded or combed, which already enters duty-free. U.S. tariffs on cotton that range as high as $0.314 per kg generally would be eliminated within 10 years, and in some cases would be removed immediately. Tree Nuts: Japan immediately would eliminate tariffs on certain fresh and dried nuts, including tariffs of 2.4% on almonds, 10% on walnuts, and 4.5% on pecans. An existing zero tariff rate on pistachios would be locked in. Vietnam would eliminate tariffs of 5% to 20% on walnuts and 10% to 20% on almonds by year three of the agreement. U.S. tariffs of up to $0.265 per kg on fresh or dried nuts would be eliminated within five years, whereas imports of prepared or preserved nuts would generally be tariff-free within 10 years, except for nut mixtures from Australia, which would be phased over 20 years. Citrus Fruits: Japan would eliminate tariffs of 16% and 32% on oranges over six and eight years, respectively. The higher tariff—currently in force from December through May-would be shortened to December through March, thereby extending the lower tariff season to April through November. The higher tariff period would be subject to a safeguard for seven years, beginning at 35,000 metric tons and increasing by 2,000 tons each year, with a corresponding tariff of 28% in the initial five years and 20% for the final two years. A 10% tariff on grapefruit would be eliminated in six years. Tariffs on orange juice and grapefruit juice of up to 28.9% would be phased out in eight years and six years, respectively, while a 6% tariff on lemon juice would be eliminated immediately. Non-Citrus Fruits: Japan's tariff of 17% on fresh apples would be reduced by 25% immediately, then eliminated in equal annual stages over the next 10 years. The tariff of 8.5% on fresh cherries would be cut in half upon entry into force of the agreement and eliminated over the next 10 years. Tariffs on fresh grapes of 7.8% and 17% (depending on the season) would be eliminated immediately, as would a 1.2% tariff on raisins. A tariff of 6% on fresh apricots, peaches, nectarines, plums, and strawberries would go to zero immediately, as would a 6.4% tariff on kiwifruit and a 3% tariff on avocados. Vietnam would eliminate over three years tariffs of 15% on fresh grapes and apples and a 17% tariff on raisins, and would eliminate over two years a 20% tariff on fresh cherries, among other reductions. Malaysia would immediately eliminate its 5% tariff on fresh grapes. The United States would immediately eliminate tariffs on fresh apricots, cherries, mangoes, papayas, peaches, pears, plums, and strawberries. Sugar: The United States would expand access to its market for sugar incrementally by establishing new TRQs for sugar and sugar-containing products totaling 86,300 tons annually, representing 2.4% of U.S. sugar imports in 2014/2015. Australia and Canada would immediately receive new duty-free quotas totaling 65,000 tons and 19,200 tons per year, respectively. The residual would be split between Japan, Malaysia, and Vietnam. The Australian and Canadian TRQs include the potential for expansion in years when additional U.S. sugar imports are required. The additional TRQ for sugar is not expected to threaten the integrity of the U.S. sugar program, but it could displace a portion of Mexican sugar exports to the United States, which are managed under bilateral suspension agreements. |11| Japan would provide new TRQs that would expand access to its market for sugar and sweetener-related processed products on a duty-free or preferential-tariff-rate basis, including chewing gum, chocolates and products containing chocolate, confectionery goods and other such products, and would eliminate tariffs on various sweetener products over time. Tobacco: U.S. tariffs on tobacco of up to 350% would be eliminated within 10 years, while Japan would eliminate tariffs on smoking tobacco and cigars over 11 years, and Malaysia would eliminate all tariffs on tobacco and tobacco products over 16 years. Vietnam would create a TRQ of 500 metric tons for unmanufactured tobacco imports that would increase by 25 tons each subsequent year, with no limit from year 21. Vietnam also would eliminate in-quota tariffs on unmanufactured tobacco over 11 years and for all tobacco leaf in 21 years. Vietnamese tariffs on blended tobacco, cigars, and other tobacco products would be eliminated over 16 years. A controversy has emerged over a provision in the Exceptions chapter of the agreement that allow countries to deny recourse to protections under the investor state dispute settlement (ISDS) to tobacco product manufacturers for claims directed at tobacco control measures. This optional exclusion would not apply to leaf tobacco, although to the extent that tobacco product sales could be blunted by this provision it would appear to have the potential to affect sales of leaf tobacco. USDA has compiled summaries with additional detail on how the agreement addresses market access for numerous farm commodity groups at http://www.fas.usda.gov/data/tpp-benefits-specific-agricultural-commodities-and-products. includes a limited selection of additional food and agricultural products that would be subject to liberalized terms of trade under the TPP agreement. The TPP agreement addresses a number of trade-related measures beyond tariffs and TRQs that are of importance to producers and exporters of food and agricultural products, among which are rules of origin; sanitary and phytosanitary measures (SPS); agricultural biotechnology; geographic indications (GIs); export programs; and technical barriers to trade—all of which are discussed below. Additional criteria are provided to determine whether fish, shellfish, and marine life are of TPP origin. A de minimis provision in the agreement allows for goods to be considered of TPP origin even if they include content from non-TPP members as long as the value of all the non-TPP content does not exceed 10% of the transactional value of the good. The agreement articulates a number of exceptions to this 10% de minimis rule for certain agricultural goods. These exceptions include dairy products and preparations that contain more than 10% milk solids by dry weight and which are used to produce various other dairy products, as well as infant formula, mixes and doughs, ice cream, and animal feeds. Also not covered by the de minimis rule are certain edible oil-bearing crops of non-TPP origin used to produce vegetable oils, including soybean oil and peanut oil; citrus juices and various fruit of non-TPP origin that are used to produce certain fruit and vegetable juices; and non-TPP peaches, pears, and apricots (whether fresh or dried) that are used in the production of prepared or preserved fruit. As tariff rates have been lowered for food and agricultural products in recent decades, non-tariff barriers have gained greater visibility as obstacles to trade. Among the non-tariff measures the TPP seeks to address are sanitary and phytosanitary measures (SPS), which consist of actions that address issues of food safety, plant pests, and animal diseases. |12| Among SPS commitments the agreement addresses are the establishment of an SPS committee composed of TPP member representatives; an obligation to base SPS measures either on international standards or on objective scientific evidence and to select risk management measures that are no more trade-distorting than necessary; a commitment to allow for public comment on the development of SPS measures; and the obligation to provide rapid notification of shipments held on importation. Importantly, SPS disputes are to be addressed first in technical consultations among governmental authorities under a procedural timeline established in the agreement. If the issue cannot be resolved through technical consultations, parties may turn to dispute settlement procedures in the agreement. The TPP agreement commits the signatories to increase transparency and provide notification of national laws and regulations pertaining to products of agricultural biotechnology products. |13| It also encourages information sharing on issues related to the occurrence of low-level presence (LLP), or trace amounts, of biotech material in food and agricultural products. To minimize LLP occurrences and any disruptions to trade that may result from an such incidents, both importers and exporters commit to exchange certain information, such as product risk assessments and new plant authorizations. The agreement also establishes a working group on agricultural biotechnology within the TPP Committee on Agricultural Trade. The working group is to function as a forum for exchanging information on issues such as national laws, regulations, and policies affecting trade in biotech products. Finally, the agreement states that parties are under no obligation to adopt or modify existing laws, regulations, or policies that apply to biotechnology. Geographical Indications (GIs) are geographical names that act to protect the quality and reputation of a distinctive product originating in a certain region. As such, GIs can be commercially valuable and, as intellectual property, can provide eligibility for relief from acts of infringement or unfair competition. GIs are most often, but not exclusively applied to wines, spirits, and agricultural products. Examples of GIs include Parmesan cheese and Parma ham, Champagne, Florida oranges, Idaho potatoes, Washington State apples, and Napa Valley wines. GIs have become a point of controversy in international trade because GIs that are considered by some to be protected international property are considered by others to be generic or semi-generic names and thus not protected. For example, "feta" is considered a generic name for a type of cheese in the United States, but is a protected GI in the European Union (EU). As such, U.S.-produced "feta" cannot be sold under that name in the EU. This type of exclusivity can extend beyond the EU, for example, when a third country has agreed to recognize EU-approved GIs under a bilateral trade agreement. The TPP agreement obligates members that provide for recognition of GIs to make this process available and transparent to interested parties within the TPP, while also providing a process for canceling GI protection. Parties that recognize GIs also are to adopt a procedure by which interested parties may object to the provision of a GI before it is officially recognized. Among the reasons the agreement lists for opposing a GI are the GI is likely to cause confusion with a trademark that is recognized within the country, or for which a preexisting application is pending; the GI is the customary term for same item in the common language of a country. Specific to wines and spirits that are "products of the vine," TPP members are not required to recognize a GI of another member if the GI is identical to the customary name of "a grape variety existing in that party's territory." The criteria for determining whether a term is the customary common name for a good, include whether the term is used to identify the good in dictionaries, newspapers, and websites, and whether the term is the name by which the good is marketed and referenced in trade in the country. Finally, concerning other international agreements involving TPP members that provide for the protection of GIs, the TPP agreement states that members are to make available to interested parties information concerning the GIs involved in other agreements and to allow them a reasonable opportunity to comment on, and to oppose, the prospective recognition of the GIs. These obligations would not apply to international agreements that preceded the entry into force of the TPP agreement. On the topic of agricultural export programs, signatories to the agreement commit to eliminate the use of export subsidies, a type of incentive the United States does not employ in any case. The export subsidy ban is seen mainly as setting a standard for future reform on a multilateral basis. A commitment around export credits, credit guarantees, and insurance programs—which the United States does employ—is less ambitious: the agreement merely states that the parties will cooperate to develop multilateral disciplines around these programs. The agreement also discourages restrictions on exports of food and agricultural products. To this end, it commits TPP countries to limit such restrictions to six months and requires a country that imposes such restrictions for more than 12 months to consult with interested TPP importing countries. Technical barriers to trade (TBT) refer to technical regulation, standards, and the conformity assessment procedures of government bodies that affect trade in goods. Among the annexes to the TBT chapter, three have relevance for food and agriculture. 1. Wines and Distilled Spirits—the TPP chapter on TBT marks a first by including an annex specific to wines and distilled spirits. In essence, the agreement establishes parameters for labeling and certification of products, including what information is permitted on the label and terms that may not be excluded, such as "chateau," "reserve," and others, while seeking to preserve the ability of government regulators to protect consumers. It also creates common definitions of wine and distilled spirits and commits signatories not to require that a wine-making practice be disclosed on a label or container except for legitimate health or safety reasons. 2. Proprietary Formulas for Prepackaged Foods and Food Additives—the agreement provides that in adopting and applying technical regulations and standards, TPP members are to limit information requirements to what is necessary to achieve legitimate objectives and assure commercial interests are protected by treating the confidentiality of the information from other member states as it would for domestic products. 3. Organic Products—TPP members that have rules and regulations governing the production, processing, and sale of organic products are encouraged to exchange information concerning organic production and certification and to cooperate with other TPP members to improve and strengthen international guidelines and standards. Members that maintain requirements for organic products also are encouraged to consider expeditiously any requests from other TPP members for recognition or equivalence of standards, technical regulations, and the like. When such a request is denied, an explanation of the rationale behind the denial is to be provided. Numerous interest groups in the food and agricultural sector have stated their positions on the TPP agreement. The American Farm Bureau Federation, representing a broad cross section of farmers and ranchers, has endorsed the agreement, as have the National Cattlemen's Beef Association, the National Pork Producers Council, and the National Chicken Council, representing beef, pork, and chicken industry interests. Also declaring their support are a number of major commodity groups, including the U.S. Wheat Associates, National Corn Growers Association, U.S. Grains Council, American Soybean Association, and various peanut industry groups. In the food sector, the Grocery Manufacturers Association, representing many food, beverage, and consumer product companies, has declared its support for the agreement. The Agricultural Policy Advisory Committee for Trade on the Trans-Pacific Partnership (APAC), which is composed of a broad array of agricultural interests from producer groups to processing and exporting companies, expressed strong support for the agreement, reflecting the views of a "clear majority" of its members. |14| APAC is one of a number of advisory committees charged with assessing whether the agreement promotes the economic interests of the United States and achieves the negotiating objectives that Congress established in P.L. 114-26. A report of the advisory committee on animal products expressed clear support for the agreement among a majority of its members, concluding that TPP would increase export opportunities for the sector. At the same time, the committee expressed disappointment in the market access gains the agreement would provide for dairy in Japan and for dairy and poultry products in Canada. As such, the dairy representatives on the committee reserved final judgment on the agreement. The advisory committee on grains, feed, oilseeds, and planting seeds offered a consensus endorsement |15| of the deal, while the advisory committee representing fruit, nut, and vegetable interests concluded the agreement meets the stated objectives. The advisory committee on sweeteners also endorsed the agreement, although representatives for sweetener users characterized the additional access it provides to the U.S. sugar market as negligible. With reference to the optional carve-out of tobacco products from investor protections, the Campaign for Tobacco-Free Kids, a tobacco-control advocate, concluded the agreement is aligned with tobacco-control objectives. Support for the TPP agreement is not universal within the food and agricultural sectors. The National Farmers Union (NFU) opposes the deal, contending benefits on the export side of the trade ledger will be overshadowed by greater competition from imports, leading to lower revenues for farmers and ranchers and to job losses. Also opposed to the agreement is the United Food and Commercial Workers Union International (UFCW), which represents workers in the grocery, retail, meat-packing, and food-processing industries. The UFCW faults the agreement for the lack of an enforcement mechanism against currency manipulation, which it contends will nullify the benefits of tariff reductions, while contributing to the transfer of U.S. jobs to lower-wage markets overseas. Both organizations issued a dissenting minority report as members of APAC. Representatives of tobacco leaf growers also oppose the agreement, contending that allowing TPP countries to deny dispute settlement protections to tobacco product manufacturers could have negative ripple effects for U.S. tobacco farmers and could establish a precedent for future trade agreements. Finally the advisory committee on processed foods praised numerous aspects of the agreement, citing unprecedented new market access opportunities for processed food exports and enhanced SPS commitments, but it did not endorse the deal outright. Among the criticisms cited in its report are that dairy product TRQs provided by Canada and Japan would not provide meaningful new access to those markets and the product-specific exception to recourse to dispute settlement that can be applied to tobacco products. 16. For more on congressional process concerning TPP, see CRS In Focus IF10297, The Trans-Pacific Partnership (TPP)-Trade Promotion Authority (TPA) Timeline, by Ian F. [Back] Fergusson.